Does Card Counting Really Work In Online Blackjack? Home How Many Decks Used In Online Blackjack? How Many Decks Used In Online Blackjack? Blackjack, which is the most popular game in online casinos, is also known for its strategies. If you have been a casino player for some time you will know which strategies I am talking about here. Most of the casino strategies we follow today were originated from blackjack, including the famous card counting technique. Card counting is a casino game strategy that involves predicting the next hand based on the remaining cards in a pool. In the streets of casinos, it is infamous as a cheating method of beating casinos. In most casinos, it is prohibited and you might be thrown out if you were found counting the cards. However, that doesn’t stop people from trying. Card counting is not illegal. The worst a casino can do is throw you out from their premises or ban you for life. Now, if you are wondering whether card counting is actually possible, then the answer is yes. Although it takes years of practice and dedication to actually master this strategy, it is worth it. Card counting is said to be a definite winning strategy for casino games, especially for blackjack. As per rough calculation, this technique is known to increase the player’s long-term winning odds by as much as 102% in a casino game. It doesn’t get better than this. The things are, however, a little different when we talk about online gambling. Online casinos are more strict, based on automatic software and have less to no human intervention. So, the real question is whether card counting is possible in online blackjack or not. The simple answer to your question is No. Card counting strategy is not at all usable in online blackjack or any other online casino games, including live casinos. Deck penetration is a term closely related to the strategy of card counting. It refers to the percentage of cards that have been dealt at a given time. For example, if the dealer is in the half of a 6-deck game, that means you have 50% deck penetration. The deeper is the dealt set of cards, the higher is the penetration rate, the fewer cards are on the table, and the easier it is to make a count or a prediction of what the next card will be. 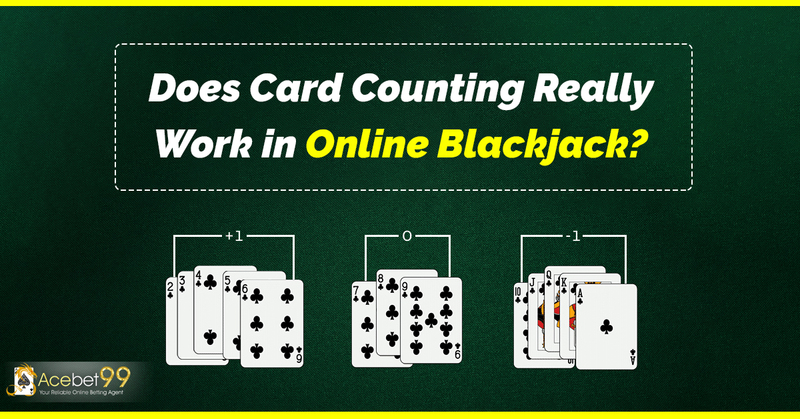 This is not possible in online casinos as the decks are automatically reshuffled after each hand in an online blackjack game, so it is impossible to count cards. In live blackjack games, however, the cards are not shuffled after each hand, but the dealers are given instructions to shuffle the cards (deck) at close to 50% deck penetration to minimize the chances of anyone using card counting strategy. The number of cards on the table is way too high before 50% deck penetration to make any prediction for the next card. So, again it is impossible to count cards in live casino gaming. There are different methods of card counting, out of which Knockout (KO) and Hi-Low are the two most famous ones. If you are planning to try your hand at this blackjack strategy, you should research about these two methods.